Turkish writer; descendant of Spanish exiles; born at Constantinople about 1850. 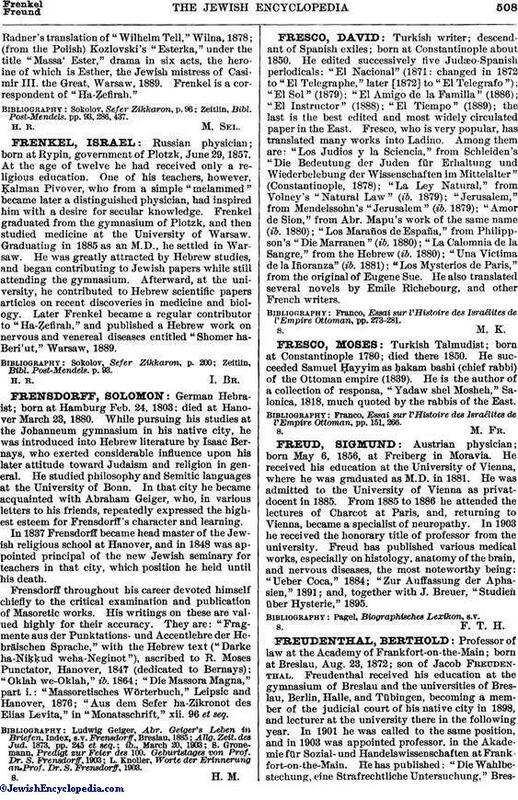 He edited successively five Judæo-Spanish periodicals: "El Nacional" (1871: changed in 1872 to "El Telegraphe," later  to "El Telegrafo"); "El Sol" (1879); "El Amigo de la Familla" (1886); "El Instructor" (1888); "El Tiempo" (1889); the last is the best edited and most widely circulated paper in the East. Fresco, who is very popular, has translated many works into Ladino. Among them are: "Los Judios y la Sciencia," from Schleiden's "Die Bedeutung der Juden für Erhaltung und Wiederbelebung der Wissenschaften im Mittelalter" (Constantinople, 1878); "La Ley Natural," from Volney's "Natural Law" (ib. 1879); "Jerusalem," from Mendelssohn's "Jerusalem" (ib. 1879); "Amor de Sion," from Abr. Mapu's work of the same name (ib. 1880); "Los Maraños de España," from Philippson's "Die Marranen" (ib. 1880); "La Calomnia de la Sangre," from the Hebrew (ib. 1880); "Una Victima de la Iñoranza" (ib. 1881); "Los Mysterios de Paris," from the original of Eugene Sue. He also translated several novels by Emile Richebourg, and other French writers. Franco, Essai sur l'Histoire des Israélites de l'Empire Ottoman, pp. 273-281.